I suppose it would be appropriate to write this week’s column to the tune of thankfulness. And I suppose it might be refreshing to be sincere, instead of cynical. But then where, oh where, to start? Am I thankful for a day or two of rest? Of course. A break from the daily demands of higher education? Absolutely. A day to embrace gluttony, embarking on a feeding frenzy that will surely continue until a half-hearted New Year’s resolution to get fit? Indeed, I feel it is my right as an American citizen. Am I thankful to spend time with my immediate family? I will remind you that Thanksgiving eve is the biggest income generator for drinking establishments across the nation, and this tradition may have something to do with that economic phenomenon. Am I thankful for the opportunity to pull myself out of a turkey coma in the middle of the night and wait outside my local Mecca of capitalism in order to obtain needful things at the lowest possible prices before I disperse them to people I feel obligated to please throughout the holiday season-- or perhaps just keep them for myself? Again, I feel it is my right as an American citizen. But this week, there is something to truly be thankful for, and that is justice. After a long and suspenseful waiting period, ordinances 7905 and 7906 have officially passed. 12 classes of people are now protected from housing and employment discrimination in our city, including pregnant women, transgender persons and veterans. 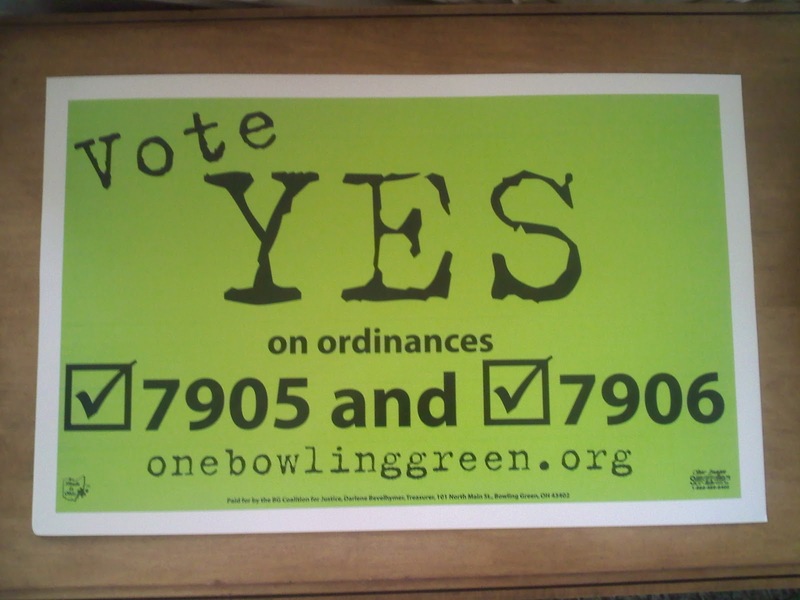 Finally, the controversial One Bowling Green campaign can be described as an incredible success in the past tense. The outcome of the election was postponed to verify a plethora of provisional ballots. Students were asked to prove their residency to the board of elections and many feared that apathy would sink in, preventing them from taking that extra step. As soon as the polls closed, One BG assumed the responsibility of chasing down the very people they had already convinced to vote weeks before. Strolling through the neighborhoods of our community, one could see that we were rigidly divided. Red signs matched green signs, yard for yard. Houses seemed to be arguing, “Yes. No. Yes.” And residents on both sides were beginning to panic. Homophobic opposition had convinced a considerable amount of people social norms dictating bathroom usage would be destroyed (as would the very fabric of society) if Bowling Green made it illegal to fire people or refuse them an apartment for being gay. But in the end, common sense-- and “Yes,” prevailed. And my faith in humanity was restored. For that, I am very thankful. I wrote a column earlier this year explaining the importance of the issue and the crucial part the University would play in passing this legislation. I’d like to think my urging had something to do with this victory. So I am also thankful for the space I have each week to be heard and make a difference the best way I know how—with my words. But the real heroes are the community leaders that put on a green shirt and handed their lives over to that miserable and demanding tyrant better known as political activism. No one realizes how hard it is to make the world a better place until they’re actually attempting to facilitate social change. So lastly, I am most thankful for the local volunteers who were selfless enough to prioritize ensuring the rights of our citizens over their own hectic schedules. While recruitment may have seemed aggressive at times, I feel the ends justified the means. As much as some you might have hated being approached by people with clipboards, imagine being the one holding it. Or imagine a more relaxed approach that might have jeopardized the results. Now that it’s all said and done, can we agree that it was worth it? Say it with me—we won. So Monday, November 22, 2010 will go down in history as the day Bowling Green became a fair and welcoming community thanks to a very memorable grassroots movement. Perhaps it will get its own holiday, as it is truly something worth celebrating. And most definitely something to be thankful for.